August 22, 2002, L. G. Crabo. 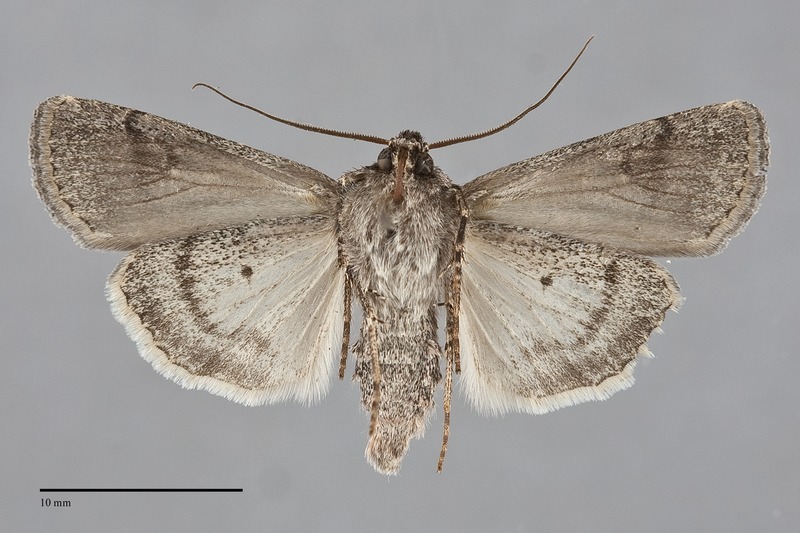 Euxoa occidentalis is a powdery charcoal-gray small to medium-size Euxoa (FW length 14–17 mm) with a light gray-filled orbicular spot and slight reddish lining the reniform spot that flies is dry forests during late summer and early fall. There is relatively little variation in color in this species. The cell is often darker gray or black. A blackish shade precedes the subterminal line, but the terminal area is usually of the ground color. The basal, antemedial lines, and subterminal lines are gray or black, double with strongest components abutting the median area, filled with gray, sometimes with a weak coppery cast. The basal and antemedial line are slightly irregular, and the latter line is even in strength across the wing and is angled slightly toward the outer margin. The median line is blackish gray, usually nearly as dark as the subterminal shade. The postmedial line is similar in prominence to the antemedial line and is also even in strength from the costa to the posterior margin. It has a finely scalloped inner component, is drawn toward the base on the costa, smoothly or bluntly excurved around the reniform spot, then slightly concave and angled 45° toward the base to the posterior margin. The subterminal line is yellowish, sometimes light gray, usually diffuse and broken into a series of spot, slightly irregular in course, preceded by the aforementioned black shade. The terminal line is thin and the fringe matches the terminal area. The orbicular and reniform spots are partially outlined in thin dark gray, are lined with thicker pale lines. The orbicular spot is relatively small, ovoid, often lacking a dark outline but consistently lined with pale gray, usually with a weak ocellus. The reniform spot is usually incomplete, is lined with pale gray, luteous, or light orange scales and is filled centrally with the ground color. The ground claviform spot is often absent, partially outlined with dark gray to black and often containing yellow or orange scales when present. The hindwing is medium-dark gray with a darker gray margin, with dark veins, discal spot, and terminal line. The hindwing fringe is white with a light gray base. The head and thorax match the forewing color with a thin black line across the mid-collar. A frontal tubercle is present. The male antenna is strongly biserrate, appearing fairly wide. Euxoa occidentalis is placed in the large subgenus Euxoa. This species can usually be identified by its late summer and fall flight period, the powdery dark gray color, even dark gray and gray lines, and the light gray orbicular and yellow or orange reniform spot filling. It is most similar to Euxoa satis and some forms of Euxoa tessellata. Euxoa satis can have nearly identical coloring and a very similar pattern to E. occidentalis. It has a larger dark-rimmed elliptical orbicular spot with darker filling, the most distinguishing feature, and forewing lines that tend to fade posteriorly. Euxoa tessellata is a variable and common moth that usually flies slightly earlier in the year than E. occidentalis. It is usually light blue-gray and more mottled, often with brown shading, and has larger spots with more consistent dark outlines. Its males often have a yellow or orange spot on the thorax at the base of the forewing that E. occidentalis lacks. The identity of females can be confirmed by examining the tips of the ovipositor lobes under magnification. Those of E. occidentalis have a sclerotized flange at the tip of each lobe while those of E. tessellata are blunted apically without flanges. 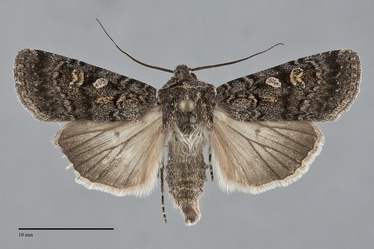 This moth is related to Euxoa comosa but can be distinguished from it by color, powdery charcoal in E. occidentalis and gray-brown in E. comosa. The type locality of Euxoa occidentalis Lafontaine is Sumpter, Oregon, 28 mi W of Baker, 4430'. This species is narrowly restricted to coniferous forests in western North America. In the Pacific Northwest, it is moderately common in ponderosa pine and mixed conifer forests at middle elevations east of the Cascades. It also flies in spruce-fir forests at high elevations, but is less common in this habitat. Euxoa occidentalis occurs east of the British Columbia Coast Range and Cascade Range summits as far north as southern British Columbia. The range extends south through the eastern portions of Washington and Oregon. It is most common along the foothills of the Cascades in Washington and in the Blue Mountains of Oregon. It has not been recorded from Idaho but undoubtedly occurs there because it occurs in western Montana. The range extends south through the Sierra Nevada and Transverse Ranges to southern California. The eastern limit of its distribution is western Montana and northern Utah. This species flies in late summer and fall. It has been collected from mid-August through September in our region. This species flies at night and is attracted to lights.